ence, and what the best scheme to allocate the spectrum holes to unlicensed users to maximize the fairness. time, frequency, and geographic locations. interference to the licensed user. 412 L. YU ET AL. 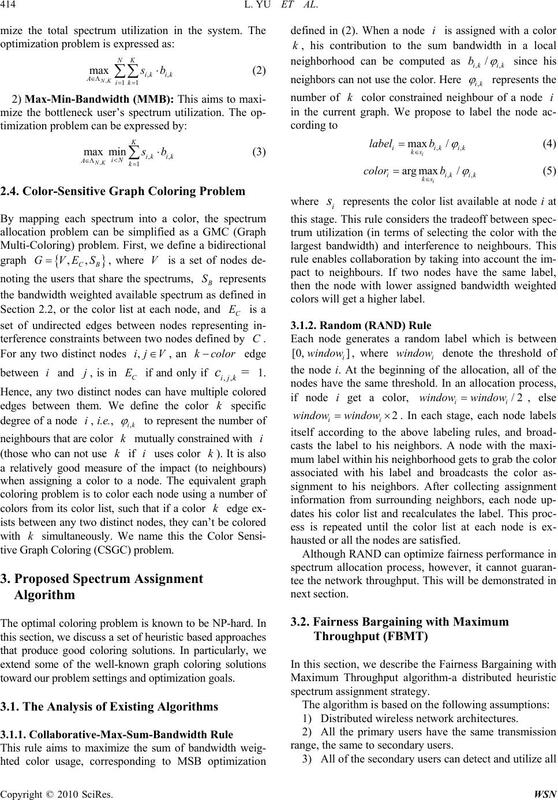 than the centralized algorithm in spectrum assignment. fewer primary users and secondary users. 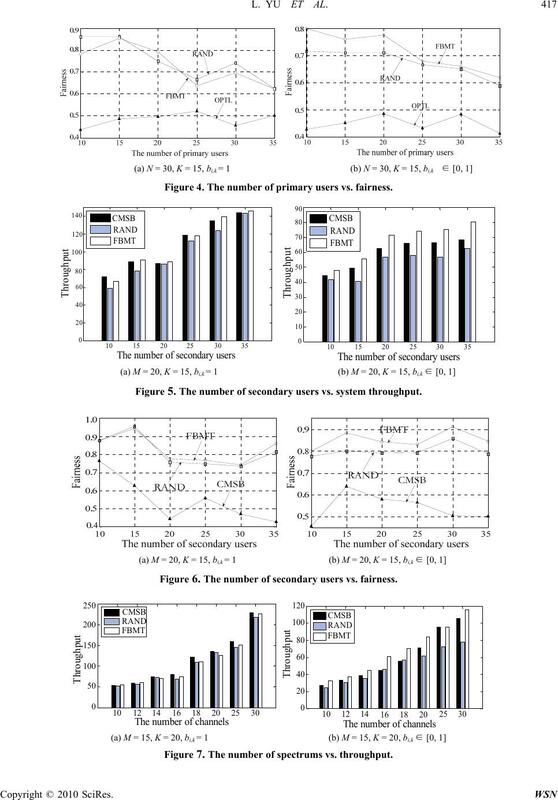 Fairness Bargaining with Maximum Throughput (FBMT). tionary detection to get the usable spectrum opportunity. Figure 1. 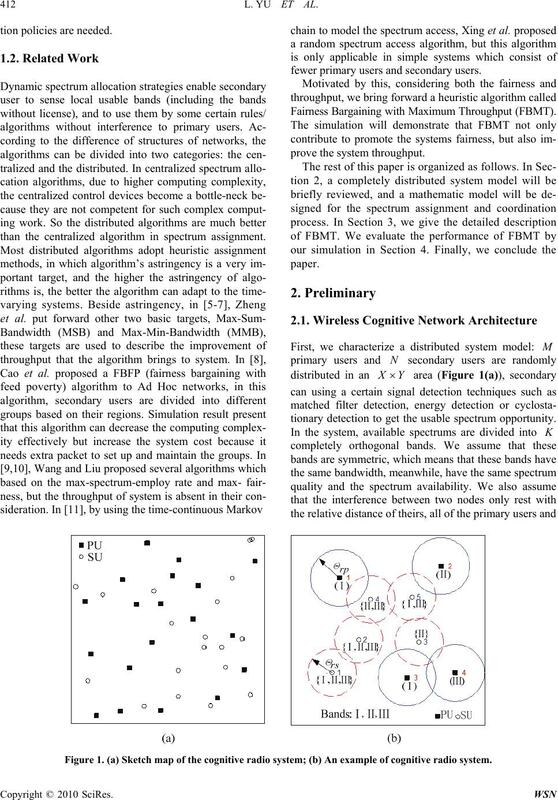 (a) Sketch map of the cognitive radio system; (b) An example of cognitive radio system. user, secondary user and spectrum bands respectively. 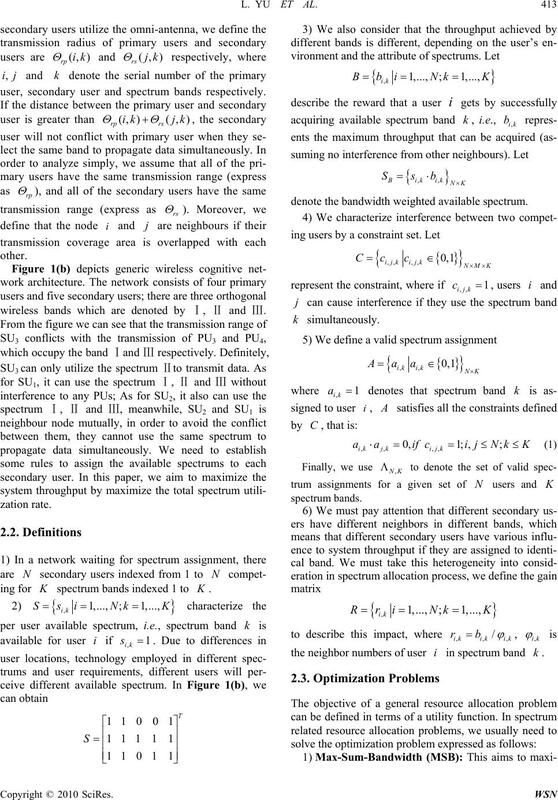 wireless bands which are denoted by Ⅰ, Ⅱ and Ⅲ.
denote the bandwidth weighted available spectrum. the neighbor numbers of user in spectrum band . 414 L. YU ET AL. terference constraints between two nodes defined by . between and , is in if and only if 1.
tive Graph Coloring (CSGC) problem. toward our problem settings and optimization goals. colors will get a higher label. hausted or all the nodes are satisfied. 1) Distributed wireless network architectures. range, the same to secondary users. denotes the distance between the node and node . spectrum allocation by introduction of the fairness factor. Figure 2. Pseudo code of HBTM algorithm. these users are deployed at random in our simulation. 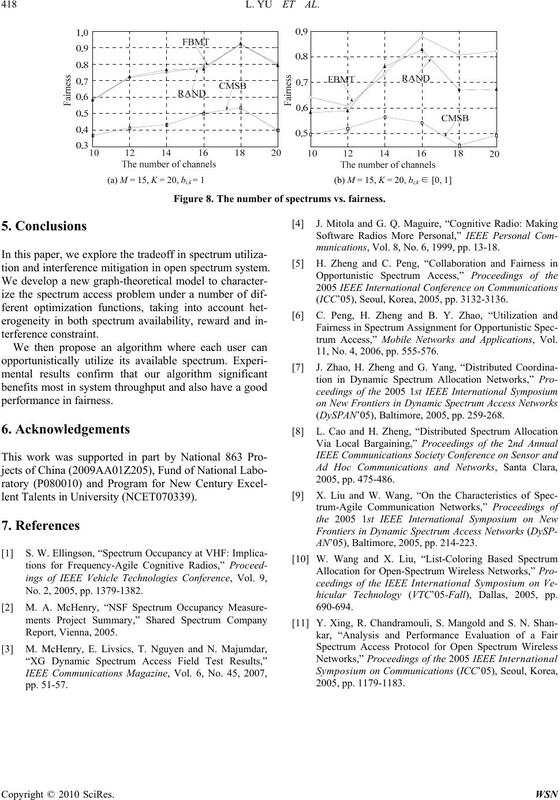 416 L. YU ET AL. Table 1. The simulation circumstance. 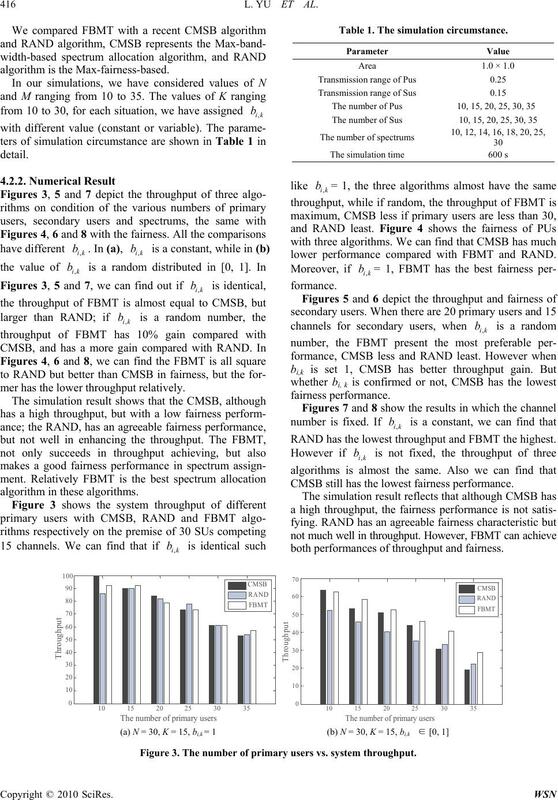 lower performance compared with FBMT and RAND. mer has the lower throughput relatively. RAND has the lowest throughput and FBMT the highest. CMSB still has the lowest fairness performance. both performances of throughput and fairness. Figure 3. The number of primary users vs. system throughput. Figure 4. The number of primary users vs. fairness. Figure 5. The number of secondary users vs. system throughput. Figure 6. The number of secondary users vs. fairness. Figure 7. The number of spectrums vs. throughput. 418 L. YU ET AL. Figure 8. The number of spectrums vs. fairness. munications, Vol. 8, No. 6, 1999, pp. 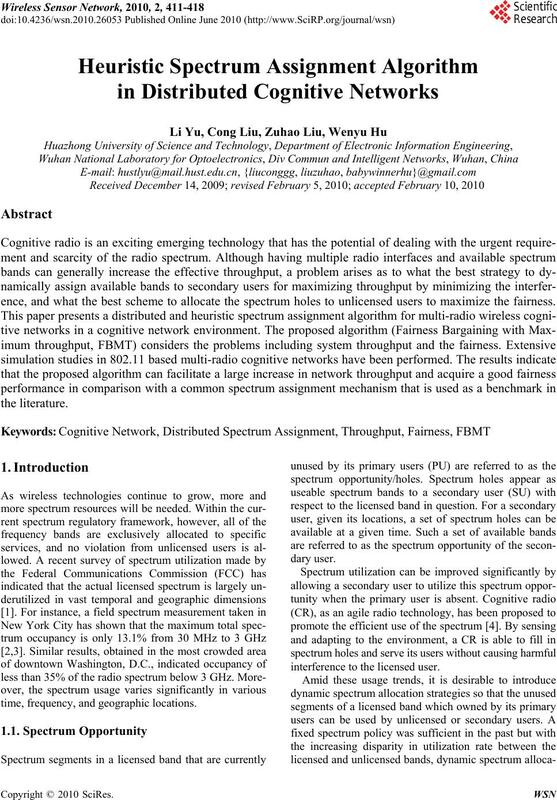 13-18.
tion and interference mitigation in open spectrum system. (ICC’05), Seoul, Korea, 2005, pp. 3132-3136.
trum Access,” Mobile Networks and Applications, Vol. 11, No. 4, 2006, pp. 555-576. (DySPAN’05), Baltimore, 2005, pp. 259-268. AN’05), Baltimore, 2005, pp. 214-223. No. 2, 2005, pp. 1379-1382.
hicular Technology (VTC’05-Fall), Dallas, 2005, pp.